Y, J and C, as previously described. "Pizza, Birra y Cortos 7 Film Festival", Gálvez, Santa Fe, Argentina, Oct 2012. "Vancouver Latin American Film Festival", SFU-Harbour Centre, Vancouver, Canada, Sep 2012. “14 Buenos Aires Festival Internacional de Cine Independiente – BAFICI”, Buenos Aires, Argentina, Apr 2012. The documentary aims to reproduce the quality of the Simple, as characterized by the life and writing of he who writes: "[...] and the wonderful image of the humble present became a feeling which overpowered all others. The future paled, and the past dissolved... I had the whole rich earth immediately before me, and I still looked only at what was most small and most humble." This thought, which fuels this project from its inception, belongs to Swiss writer Robert Walser (1878-1956), who spent a third of his life confined to a mental institution, save for his promenades in the mountains. His words comprise a longstanding philosophical idea, formulated by William of Ockham, who proposes to waive the complexity involved in the unnecessarily multiple for the simple-singular. This concept can be perfectly transposed to the reality of frantic consumption in contemporary capitalist life. In contrast to this approach, the three portraits of this documentary describe three versions of simplicity, framed in the stunning natural scenery of rivers, steppes and mountains of the southern tip of the American continent. 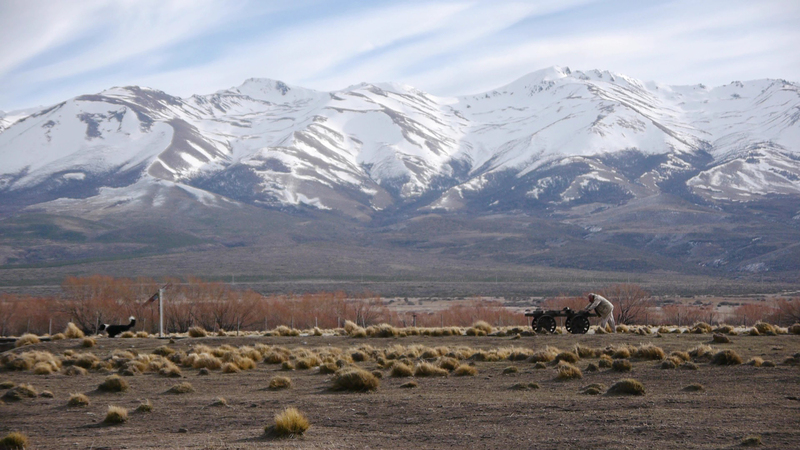 Far from the Maddness of the World, a feature-length documentary project, is mainly an observational triptych which portrays the lives of three Patagonian men that live in isolation, leaving no significant ecological footprints. The son of Basque emigrants, a retired railway worker now lives in an abandoned train station in the remote steppe of the southern tip of the American continent. There, he raises livestock and finds the means to survival under harsh weather conditions. Back in the 70s, escaping from the bloodshed of a military dictatorship and the intolerance of a family that could not stand The Beatles, J took off from Buenos Aires to London, Berlín and Goa in India. After alternating between punks and mystic Osho, he landed in Bolsón, the "Argentinean Woodstock". Himself a mystic figure, J lives next to a crystaline river, which provides power and quietude to his "apocalyptic paranoia". Almost 400 meters high and 100 meters wide, Piedra Parada (Standing Rock) stands amid relentless wind, like an impenetrable tower in Patagonia. A challenge for many climbers, the site has become, however, the residence of a Canadian who chose a secluded life away from his native country, safe from the spell of capitalism. The three observed lives constitute three dissimilar examples that illustrate the concept of Simple Life as contained in a quote from writer R. Walser, who originated this project: "The future paled, and the past dissolved... I had the whole rich earth immediately before me, and I still looked only at what was most small and most humble." The documentary, which should serve as a mirror to the viewer, is a tribute to the Simple: that which "conserves the puzzle of what abides and what is great. ", according to M. Heidegger, and an attempt to raise awareness while fanaticism, consumption and the wars that feed them acquire the intensity and form of a whirlwind that drags us deeper down in free fall. It is mostly an observational documentary, devoided of the usual conventional elements (talking heads, authoritative voice-over and excesive use of music). Thus, the images and time will play a fundamental rôle in portraying the lives of all three characters. To be able to find the means to access additional funding sources to finance the completion and promotion of the project (€ 4944.54). Second and third segments: May through September, 2013. One-third of the script has already been developed and completed (see Vimeo link). I am currently working on a parallel research of the other two characters, so that I can develop the remaining 2/3 of the script.